A research scientist and technical staff from the University of Memphis Center for Earthquake Research and Information (CERI) are collaborating with the U.S. Geological Survey, The Incorporated Research Institutions for Seismology, Virginia Tech, and Lamont Doherty Earth Observatory to record aftershocks related to the August 23, 2011 earthquake near Mineral, Virginia, 1:51 PM EST. These groups are pooling their resources to rapidly surround the area with a high quality array of portable seismograph stations. “The aftershock sequence may or may not last very long so we have to get into the field quickly to strategically distribute the array around the epicenter of the main shock to pinpoint aftershock locations,” said Dr. Steve Horton, CERI Research Scientist. Dr. Horton and CERI technical staff member, David Steiner, left Memphis within hours of the main shock on Tuesday and have installed 4 CERI seismograph stations and assisted in the installation of several others. Updates on CERI aftershock monitoring will be posted the CERI website. 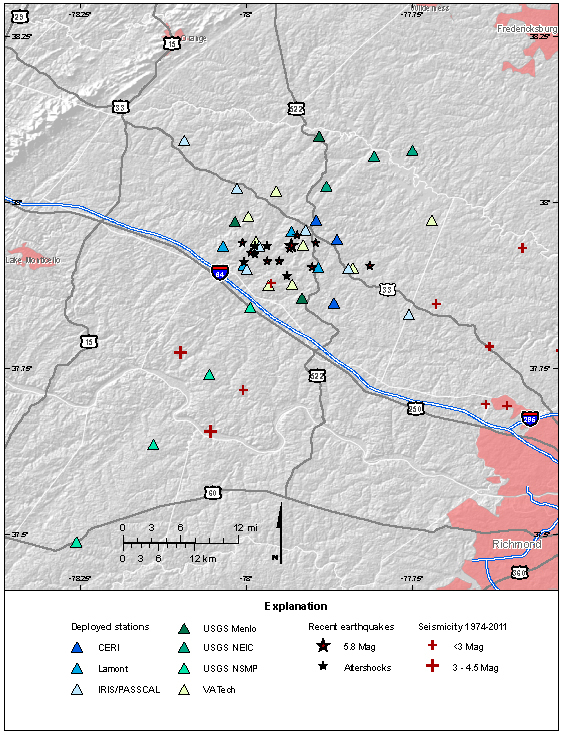 Background information on the Mineral VA quake can be seen at the Lamont Doherty website, http://www.ldeo.columbia.edu/news-events/magnitude-58-quake-rattles-east-coast. A portable seismic network of this nature provides accurate 3 dimensional locations of aftershocks, most of which are too small to be felt by humans. While sufficient to accurately locate earthquakes larger than magnitude 3, the National Seismic Network is too widely distributed to pinpoint the depth of smaller quakes in relatively quiescent areas. If enough data can be collected, this effort will help scientists understand the characteristics of the specific fault that ruptured on August 23, including its minimum size and general orientation. Total surface area is one of the key parameters in understanding the largest possible earthquake that could occur on a specific fault.